Lovely arrangement featuring over 36 roses in shades of pink with lilac limonium and fresh greens in a French style ceramic vase. Send a beautiful expression of caring with this stunning white arrangement featuring roses, asiatic lilies, alstroemerias, eucalyptus and assorted greenery. It is delivered in a white glass vase. Romantic arrangement of red roses, spray carnations, daisies, hypericum and fine foliage for extra texture and movement. 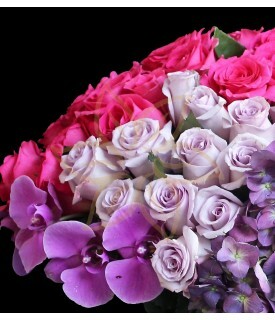 We place this arrangement in a French style ceramic vase. Gorgeous flower basket full of dazzling blooms like tangerine roses, daisies, strawflowers, hydrangeas, accentuated with seasonal textures in an organic basket. Radiant design featuring 20 orange tulips alongside gorgeous foliage in same hues. Tulips are placed in a sophisticated glass vase. Spectacular design featuring roses, daisies, alstroemerias and fine foliage in shades of yellow and green placed in an elegant white glass vase. Gorgeous design with sunflowers, roses, daisies alstroemerias alongside fresh foliage and beautifully arranged in an original vase decorated with tree bark.